Bonsai Soil: How is it different? Why is it better? Soil composition is easily the most debated topic in all of bonsai. Precisely because in the details it can be as individual as the circumstances in which you use it. 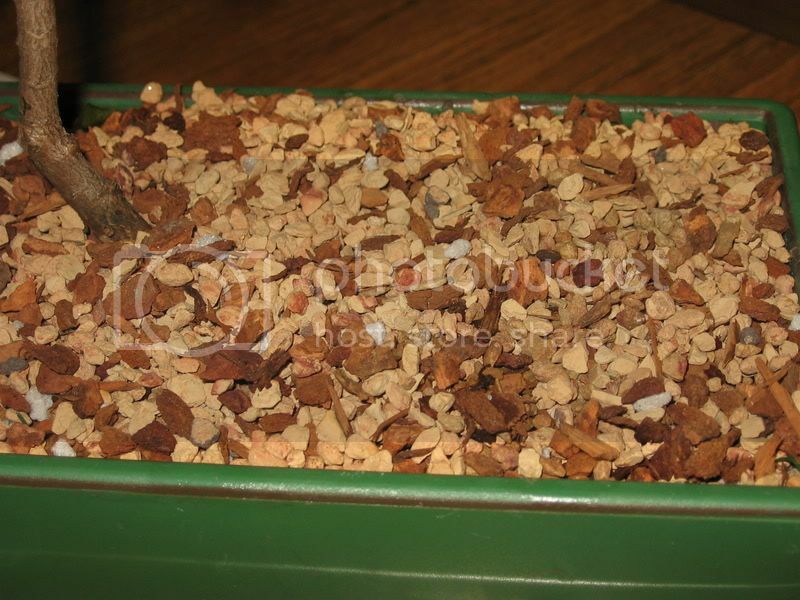 Bonsai soil is: A mixture of inorganic and organic materials in large course particles that enhance aeration and drainage while still retaining moisture and nutrients. This helps to promote a healthy fibrous feeder root system. Many pros use strictly inorganic mixes which require dedicated watering and fertilizer routines. Their efforts are rewarded with spectacular growth. It is important to have a soil mixture that works for your conditions. IE: What works perfectly in arid Mesa, AZ would retain way to much moisture for someone in rainy Seattle, WA. The 'Seattle mix' would dry out too quickly for Kansas City...etc. This is why it is important to understand the function of your soil wrt its components. Hopefully the links below will help you come to a better understanding of what your bonsai require in their pot. Considering you cannot do one without the other, I have posted some links that have to do with bonsai soil, Repotting, And Root Pruning. As you study these links you will find a wealth of experience and opinions. They may differ slightly but each is working for that persons environment. This is a key issue to address. Often people ask 'What is the best soil mix for [Random tree type/location]?' This question has as many different answers as there are variables [and people] involved in bonsai itself. Keep in mind that what your seeing is not a topdressing, It is identical to the entire contents of the pot. Now take a look in your pot, There may be room for improvement. If after reading the links you still have additional questions about bonsai soil, Please ask them at this thread: http://www.helpfulgardener.com/forum/v ... php?t=3530 and we will do our best. Why, When, How, Do I have everything I need, What's all this then? All of this and more answered about Repotting & Root pruning in the links below. Bonsai is container gardening, Often in small containers. Usually, Bonsai are in training pots while in development. 'Repotting' is moving them from one container to another, It's best done just before the end of dormancy for temperate trees. Bonsai are usually repotted either due to their needing a larger/smaller pot for training purposes or for aesthetic reasons. In order for our trees to survive in their restricted environment, it is important to insure they have a healthy and productive root system. In a container the roots will eventually colonize the entire volume of the pot. [Become rootbound] It then becomes more difficult to obtain water/nutrients and as a result, New growth will slow down. In normal container culture it would simply be 'potted up.' Since in bonsai the pot is part of the design, Root pruning and the addition of fresh soil will be required if you wish for it to remain in the same pot. The best time of year to do this with temperate trees is spring [preferably] or late fall as it is a stressful procedure. [Damaging the trees ability to absorb nutrients and water.] Tropical trees may be root pruned at any point provided they are not in a growth spurt. While your tree is out of the pot the roots require misting so they do not dry out. Place your tree on a mound of fresh soil in your pot and backfill in with more soil using a chopstick to tap the soil down into air pockets and gaps in the root system. You will find far more soil goes in than you expect. After a repot it is not a bad idea [if your pot is small enough.] to give it a watering using the submersion method, 10 minutes is fine. Chances are it will have settled again so make sure you have lots of soil handy. Dive in and get your hands dirty. This information will give both you and your trees a solid foundation to grow on. I hope it will be utilized by you to the benefit of both your trees and your enjoyment of bonsai. Some science: [A highly respected bonsai artist and author herself.] Professor Amy Liang points out that 1/4 oz. of water absorbs approximately 540 calories of heat when it evaporates, And that the suns energy transmitted through a drop of dew is only 0.2 calories per minute. It evaporates before it could heat up enough to scorch a leaf. In my own experience, I have never had it happen. I live on the coast in North Carolina, I mist in our blazing summer sunshine daily with no ill effect. Just one less thing to worry about. Did you know that little bonsai do not grow up to be big bonsai. Read about it here. I regret all Spelling, Syntax, Or Grammar errors. Even the ones you didn't notice. A 'Thank You' to Webmaster for his 'bold' suggestions during the editing process, He knows what I mean. Just in case you might not know, 'Bonsai' is pronounced 'Bone-Sigh'. If you would like to take pictures that really show off your bonsai? Read this. Last edited by ynot on Sun Sep 23, 2007 1:48 am, edited 15 times in total. This is all great information, thanks ynot. I hope it is put to good use. Do visit Gnomes post here for some excellent pictures wrt root pruning. This includes a great nebari with a wonderfull example of what a healthy fiberous feeder root system looks like. A movie of some fast draining soil in action is at the the bottom of the first post in that link. Wow, thanks for all your hard work on this, Ynot. 'ts very helpful! Helpful Gardener has an excellent tutorial about Bonsai Soilby Scott Reil, the original Helpful Gardener. Great information for Bonsai soil. Bonsai soil is kind of like chicken soup recipe, every family has their own. If you talk to 10 people in the bonsai club, you will get ten different formulas of bonsai soil mix. Here is my 2 cents: What bonsai mix is depends on your watering habit, the micro-environment of your own backyard and what zone you are in. Do you agree? Pruning, Fertilization, and Repotting of a Ficus Bonsai?